I recently received a copy of the She Reads Truth Bible from Holman Bible Publishers. Developed by the team at the She Reads Truth community this Bible invites women to engage with God’s Word every day. It is the Christian Standard Bible (CSB) translation which was chosen by the She Reads Truth team for it’s good balance between scholarship and ease of understanding. 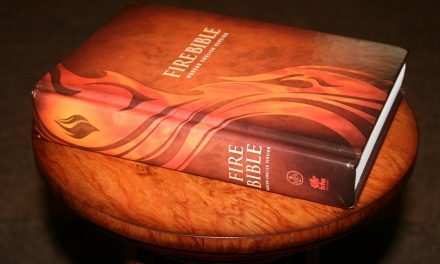 Holman Bibles provided this Bible free for review. I was not required to give a positive review, only an honest one. All opinions are my own. I have the poppy linen covered version. It is a hard cover that comes with a matching linen covered cardboard slipcase. All the printing on the spine and front of the Bible and it’s slipcase is in gold. This Bible measures approximately 8.75″ x 6.5″ x 2″ and weighs 3 lbs, 5 oz. This is my favorite of the covers because it’s different from any other Bible I own. The fact that this shade of poppy (I’d call it coral) is one of my favorite colors might also be part of why I like it so much. It has white paper that we’re guessing to be in the low 30s gsm and it’s Smyth sewn. Two ribbons, one white & one gold, are bound in. The pages are easy to turn. This Bible is also available in a gray linen cover w/ slipcover, a white hardcover, a navy LeatherTouch cover, and brown genuine leather. All versions are also available thumb-indexed except the white hardcover. It has an 8 point font. 2K/DENMARK typeset it using their Bible Serif typeface for the main text. It is in single column paragraph format with poetry set in stanzas. There are lots of section headings in all capital letters. It has 1 and 3/4 inch unlined margins. Since the paper is slightly thinner than what’s normally found in journaling Bibles you might want to be a little more careful when choosing your writing implements (or art supplies). Any pens and highlighters suitable for regular Bible paper should be fine as long as you don’t overwork the page. Book name and chapter numbers are in the top outside corners with page numbers in the bottom outside corners. The footnotes are translators notes. Each book has an introduction that includes four main types of information. They have chosen one verse from each book to give you an outline of the entire Bible. 14 different artists have contributed the illustrated portions of each of these verses that can be found across from the book introductions. Some of these illustrations are just lettering and some contain other artwork as well. All 66 complete verses can be found in the Key Verse list in the back of the Bible. The artwork and list are intended to be aids for Scripture memorization. or a chart. These help the more visual learners among us grasp the historical timing and geography of the various books. They also help us see the multiple themes of some books and the reoccurring themes that are summed up in others. There are a couple of additional maps included in the back. They designed maps specifically for this Bible and all the maps are on regular Bible paper. The popular M’Cheyne reading plan, is printed in the back with boxes for you to check off as you finish each days readings. For those unfamiliar with the M’Cheyene plan, 4 readings a day allows you to read the entire Bible once and the New Testament and Psalms twice in a single year. Also included is a She Reads Truth reading plan that will take you close to 3 years to get through the entire Bible. This plan has you read 5 days a week (instead of 7). It includes a main passage from the book you are reading straight through and gives you 2 more related passages that will help you use Scripture to interpret Scripture. Each book is divided up into between 1 and 15 weeks (only Psalms goes close to that long). These reading plans are included at the beginning of each book and also have check-off boxes. Since each book is a separate list you could easily choose your own order for this plan. I’m glad they have included both reading plans in this Bible. While reading the Bible through in a year is useful and admirable goal there is also something to be said for sometimes slowing down and taking time to cross reference and meditate on smaller chunks of Scripture. One of the features I like is the Genre Guide they have included. Each of the Testaments is divided into 5 genres; Old Testament – Pentateuch, Historical, Wisdom & Poetry, Major Prophets, Minor Prophets; New Testament – Gospels, Church History, Pauline Epistles, General Epistles, Apocalyptic. Every genre is given it’s own color. That color is on the edges of the introduction and the reading plan, and is the main color of ink (besides black) used in that section of the Bible. Once you become familiar with the genre color guide this makes it easier to understand the writing style and historical setting of what your currently reading. It also makes it easier to find the right section of the Bible as you are quickly flipping through since you can see the color slightly when the book is closed. The colors coordinate well and though a couple of them are similar they are spaced well so it’s easy not to get them confused. They have also included a topical index. A carefully selected list of what they thought would be the most important or often looked up topics and a small list of passages for each. Besides many of the features I’ve already mentioned there is a Table of Weights and Measures & a Contributors List in the back of the Bible. The contributors list will be especially handy for finding more artwork or devotionals by your favorite artists and authors either in this Bible or elsewhere. The CSB She Reads Truth Bible is a really nice women’s devotional/study Bible. I love that the focus is on reading and applying God’s Word and developing a love for it. I always caution that the Biblical text should be taken above any study notes or devotions but find it less necessary with this one since they frequently issue the same warning. This would make an excellent gift for any woman in your life (including yourself) interested in spending time with God’s Word. One of the variety of covers should appeal to most people. I have to confess to being aware but not familiar with the She Reads Truth community before receiving this. 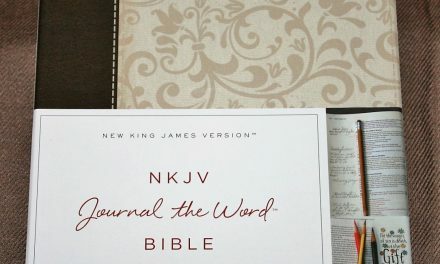 Now that I have spent time using this Bible and investigating their website I intend to frequently use their devotionals and reading plans over the next several months.